The Edit DEM Survey Properties allows the user to edit the DEM survey properties by bringing up the DEM Survey Properties Form. 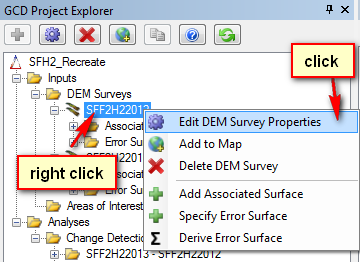 From here a user can edit the DEM survey properties, add, edit, and add to map associated surfaces, and add, edit, and add to map error surfaces that are associated with that DEM. To access the menu right click the DEM name within the GCD Project Explorer and select Edit DEM Survey Properties from the drop-down menu. This will bring up the DEM Survey Properties Form. 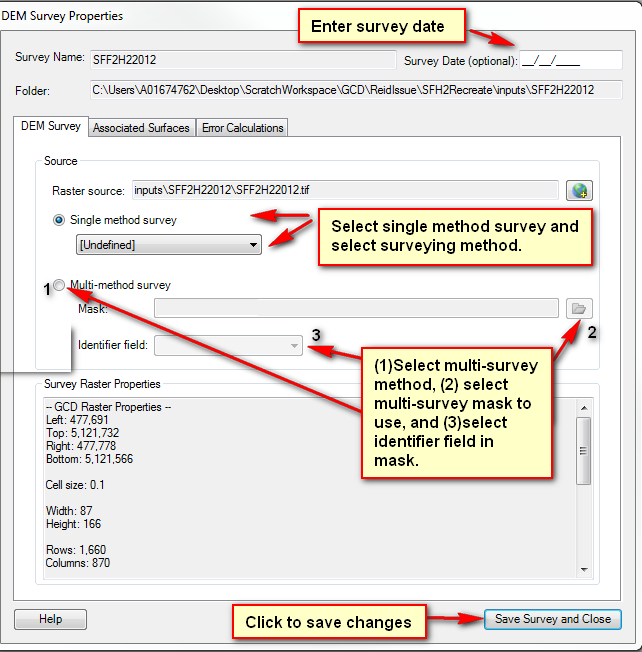 From the DEM Survey Properties Form a user can edit the Survey Date, choose whether or not they want to use a single survey or multi-method survey, and select the associated information with either survey method. Additionally a user can inspect different attributes Survey Name, Folder, and Survey Raster Properties. Within this form the user can also access the Associated Surfaces and Error Surfaces tabs of which they can add or edit these surfaces as well as add them to the map.